A number of conflicting political currents had their beginning in the Communist Workers’ Party of Poland (KPRP). One of the earliest of these were the ‘grzechiści’ (Grzechists) – rallied around Kowalski-Grzech, co-founder of the KPRP. Accused of ‘sectarianism’, ‘dogmatism’, ‘anti-democratism’ or ‘anti-Leninism’, in reality it was the only current within the party which consistently defended the communist programme and attempted to prevent the degeneration of the international communist movement. Władysław Kowalski (pseudonyms Grzech, Ślusarski) was born in Warsaw in 1883. Already involved in socialist youth organisations as a student, he was first arrested at the age of 17, and in 1903, aged 20, joined the Polish Socialist Party (PPS; he was active in Kraków, Łódź, Warsaw). After the split in 1906, he joined the PPS-Left, and soon became a member of its central committee. In the party he would oppose all social-patriotic tendencies. Grzech studied at the Jagiellonian University, in Bern and later in Paris and Freiburg; he was an economist by profession. He returned to Warsaw in 1911. He has been described as ‘eloquent, highly ambitious and longing for popularity, for the attainment of which he did not shy away from demagogy’. Following the outbreak of WWI, he was one of the authors of a joint statement put out by the PPS-Left, the SDKPiL (Social Democracy of the Kingdom of Poland and Lithuania) and the Bund against the war. His dispute with the centrists of the PPS-Left reached a turning point at the so-called Piotrków Conference in December 1915. In 1916 Grzech accused the party leaders (among them Maria Koszutska, pseudonym Wera Kostrzewa) of opportunism, and along with others on the Left disappointed with the vacillating stance taken by the party, decided to split. He rejected the programme of so-called intermediate stages in the revolutionary struggle, claiming instead that the war opened a period of decisive class struggles that could potentially lead to the overthrow of capitalism – at the time a position close to that of Lenin and the Zimmerwald Left. As a result, in May 1916 Grzech and at least 26 other members of the PPS-Left leave the party and join the ‘zarządowcy’ faction of the SDKPiL. Soon after Grzech became one of the key activists of the SDKPiL. In Warsaw, he joined the City Council as a representative of the SDKPiL. He took part in demonstrations and strikes, was an activist in social-democratic trade unions and a party publicist. Although he belonged to the ‘zarządowcy’ faction, he did not actively engage in factional disputes. Due to his left-wing views however, he did become a major opponent of Adolf Warski, one of the leading activists of the SDKPiL. In November 1916 industrial strikes broke out in Warsaw, in response to which the German authorities tightened repression against the SDKPiL, PPS-Left and the Bund. Prominent SDKPiL members, including Grzech, were arrested and sent to a POW camp in Havelberg. Grzech only returned to Warsaw in 1918, thanks to the armistice with Germany and the proclamation of Polish independence. At that point, a movement of workers' councils was growing in Poland, in which Grzech and the SDKPiL took a leading role. 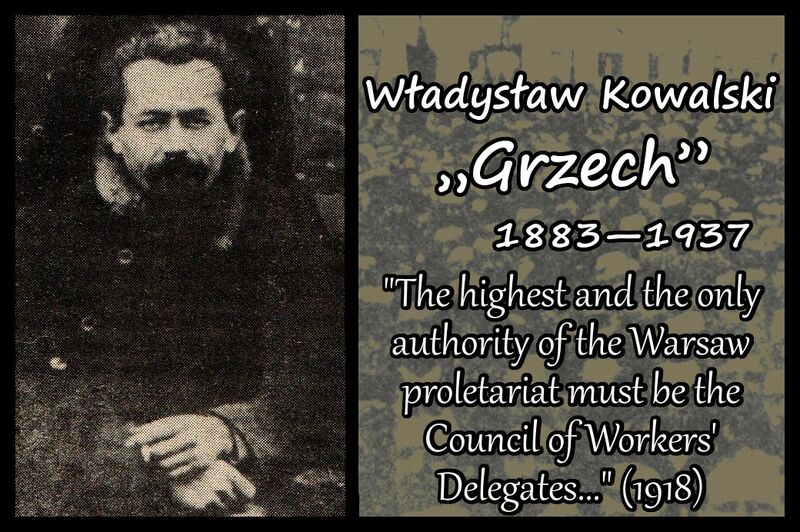 In consequence, Grzech officially left the Warsaw City Council, stating that ‘the highest and the only authority of the Warsaw proletariat must be the Council of Workers' Delegates’. Towards the end of 1918, the SDKPiL and the PPS-Left came to an agreement, and merged into a single party – the Communist Workers’ Party of Poland (KPRP). Under the banner of the KPRP, and as a member of its central committee, Grzech became an active member of the Warsaw Council of Workers' Delegates where he promoted revolutionary perspectives: ‘our task is to imbue [the workers' councils and the trade unions] with the slogans of a liberating proletariat, the slogans of the Social Revolution, the Dictatorship of the Proletariat, the supremacy of the Councils of Workers' Delegates as organs of power’. He called for the establishment of a Red Guard subordinate to the Warsaw Council of Workers' Delegates, like the one in the Dąbrowa Basin. Although already by July 1919 the workers’ councils in Poland were dismantled, Grzech continued to agitate for their revival and the realisation of workers' power. Over time his revolutionary intransigence put him in conflict with the leadership of the KPRP, resulting in the creation of a Grzechist current within the party. The term Grzechists of course comes from the pseudonym of Grzech. However, it is unlikely that his supporters identified in such a way, rather it was a term used by their political opponents and then adapted by historians of the workers’ movement in Poland. The organisational structure or even the membership of the Grzechist current is difficult to determine. Historical sources mention a number of KPRP members allegedly allied with Grzech, including Henryk Stein-Domski, Lucyna Baranowska, Włodzimierz Dąbrowski, Abram Wajcblum-Karolski and Stanisław Bobiński. Some of these activists had already been associated with Grzech in the days of the PPS-Left, when together with him they split to join the SDKPiL. But what is more important, Grzechists found considerable support among working-class cadres, especially in Warsaw where Grzech enjoyed significant popularity. In 1922 the Third International (Communist International, aka Comintern) described the opposition centred around Grzech as follows: ‘it consists of comrades not connected by any joint political position, but only by a critical or reluctant attitude to the tactical line of the party and the Communist International, or to specific aspects of the party’. This suggests that the Grzechists were never a splinter group, or even a faction, but only a loose coalition of party activists and sympathetic workers. Internationalism. ‘For the international camp of social revolution there is no question of borders; based on the principle of a commonality of interests between the international working class, it rejects all national oppression and does away with national and linguistic conflicts both within the current territories, as well as in relation to the scattered populations of so-called ethnic minorities’. ‘In the period of international social revolution, which destroys the foundations of capitalism’, the proletariat must reject ‘any political slogans based on political forms developed in the capitalist period, such as autonomy, independence, or self-determination’. A break with the Second International, whose parties in the political field ‘adapted only to a parliamentary struggle for reforms’, and in the economic field ‘to a struggle for a bigger share in the triumphs of domestic capital’. Parties, which with the outbreak of war, ‘grew to ultimately betray the fundamental postulates of socialism, internationalism and the class struggle, and instead stood in solidarity with the bourgeoisie and their governments, and participated directly in the war under the hypocritical slogan of national defence’. Rejection of intermediate steps in the struggle for socialism. With the outbreak of World War I and the Russian Revolution ‘the era of the direct struggle for the realisation of the socialist system has opened, an era of social revolution’. The party has to ‘exacerbate and deepen the confrontations between the working class and the possessing classes’, make these everyday clashes ‘part of the struggle to abolish capitalism, to establish a socialist economy through the dictatorship of the proletariat’. The dictatorship of the proletariat, which can only be realised when all power passes ‘into the hands of the proletariat of towns and villages, organised in the Councils of Workers' Delegates’. The need for a cadre party, which will ‘unite the most conscious and most revolutionary sections of the working class within the party organisation in order to give the whole movement momentum and clarity of goals’. State repression in response to the Polish-Soviet war. Between July and August 1920, about 2 000 members of the KPRP ended up in prisons. In Warsaw alone about 600 communists were arrested. Prison sentences of up to 12 years with hard labour were handed out. In other words, the party lost its original cadres, and in many places even ceased to exist. Due to the ‘white terror’ of the Polish state, the Communists ‘were simply not able to appear on the streets, even to gather in small numbers’ (Warski). The influx of new members to the KPRP, which to some extent filled the gap following the arrests (in 1921 the party still had fewer members than in 1919). In the years 1920-1921 oppositional leftist groups from the PPS (e.g. PPS Opposition), and activists from Poale Zion and Ferajnigte, joined the KPRP. In the following years also the Kombund, a communist split from the Bund, officially merged with the KPRP. These new members did not abandon all manifestations of reformism or nationalism, and these ideological leftovers eventually began to affect the internal politics of the KPRP. Stabilisation of the situation both at home and abroad: in Poland – liquidation of the workers’ councils, adoption of the March Constitution, defeat of the Red Army; abroad – the tragedy of the March Action in Saxony, pursuit of coexistence with capitalist powers by Soviet Russia (peace treaties, trade agreements). For some members of the party the lack of immediate prospects for revolution was an excuse to move away from the views expressed in the first political platform of the KPRP. Pressure from the Comintern and Lenin himself regarding the political and organisational development of the party. In 1921 a Polish translation of ‘Left-Wing Communism: An Infantile Disorder’ was issued, a text which convinced a section of the party leadership to revise its views. In the hands of the centrists of the KPRP (Warski, Wera Kostrzewa, Maximilian Horwitz-Walecki – the so-called 3Ws), and later the party's right wing, the arguments of Lenin became a useful weapon against the Left. All of these factors led to a gradual change in the composition of the party and the views prevailing within it. There was a visible difference between the KPRP of years 1918-1920, and the KPRP following the repressions of 1920. The rebuilding of the party after 1920 took place under new rules, and with an increasing interference of the Comintern. As day by day the prospect of international revolution became more distant than previously thought, in desperation the Comintern began to come up with new tactics meant to gather the masses of workers and peasants around itself. Often this led to the rejection of its original declarations. It was a result of the gradual degeneration of the Comintern, in the wake of the degeneration of the Bolshevik Party itself, which had the greatest influence in the International. 1921 and the 10th Congress of the RCP(b) (Russian Communist Party) clearly reflect this process – the suppression of the uprising in Kronstadt, a ban on factions within the party, the introduction of NEP. In Russia, like in other countries, as early as 1920 the movement of workers' councils had mostly expired. Actual power passed from the hands of the working class into the hands of the Sovnarkom, the Council of People's Commissars. The 3rd (1921) and 4th (1922) Congresses of the International approved major tactical changes – the united front, i.e. the policy of approaching and working together with the parties of social-reform (in Poland mainly the PPS), revolutionary parliamentarianism (parliament as a tribune to mobilise the masses), struggle for partial reforms and a workers’ government (as opposed to the dictatorship of the proletariat). The Grzechists were the only current in the KPRP which saw this process of degeneration and tried to prevent it. The 2nd KPRP Conference (1921, Warsaw) accepted the ‘Twenty-one Conditions of Admission to the Communist International’. Although the KPRP boycotted elections in 1919, now the question of participation in parliamentary politics, a tactic approved by the Comintern and Lenin, was back on the agenda. A pamphlet by Horwitz-Walecki, ‘O taktyce i stosunku do parlamentaryzmu’ (About tactics and the attitude towards parliamentarism, 1921), stated that ‘a further boycott would be a mistake, because a large part of the working class, whole masses, take part in elections anyway’. Following the discussions at the 2nd Conference, the party agreed to participate in elections, but not without opposition from Grzech among others. Grzech warned that opportunistic tendencies within the party would gain the most out of seats in parliament and argued that the party should instead support an anti-parliamentary line in the Comintern. It was during that 2nd Conference that a Grzechist current came into being, united around defending the political platform of the KPRP against attempts by the 3Ws (Warski, Wera Kostrzewa, Walecki) to revise it. At the 3rd KPRP Conference (1922, Gdańsk) the Grzechists made themselves heard louder than ever. At the time three distinct currents within the party came to prominence – the first, which had the support of the Comintern and was represented by Warski and Koszutska, argued for a united front, the division of the land among the peasants, and for participation in parliamentary elections. The second, a Left trend around Grzech, rejected the tactics of the unified front and parliamentarism, and opposed the division of land. The third moderate current was represented by Stein-Krajewski and Julian Brun. Grzech defended the existing politics of the party, blocking attempts at revision, and also criticised the situation in Russia. He expressed opposition to the NEP, accused Lenin of pursing a politics of compromise and stated that the RCP(b) had a negative impact on the Comintern. According to Grzech, as well as the political platform of the KPRP, World War I opened a period of decisive class struggles. Any attempts to return to the pre-war politics of the socialist movement, on top of that the politics of its moderate sections (programme of intermediate stages, participation in bourgeois elections, collaboration with the PPS, etc.) was a step backwards, a departure from the lessons learned by the experience of the Russian revolution and the movement of workers' councils in Poland. It was also no coincidence that it was the 3Ws who stood at the forefront of this process – over the past decade Grzech clashed with Koszutska in the PPS-Left, and with Warski in the SDKPiL numerous times. Now these divisions sharpened again. In response to his criticism, a political attack on Grzech was carried out within the pages of the party paper ‘Nowy Przegląd’ (New Review). Warski accused Grzech of the ‘infantile disorder of Leftism’, described the Grzechists as ‘our KAPDists’ (from the KAPD, the Communist Workers' Party of Germany), and as ‘a pseudo-revolutionary current’ that uses ‘anarcho-syndicalist expressions’. From that moment onwards similar arguments and accusations of sectarianism and dogmatism were to be used to combat any Left Communist arguments within the party. The united front. ‘The Soviet Government wants to exploit all means to support its policies. In this respect, the influence of social-compromise and social-opportunism on the politics of bourgeois government can have great importance. The tactic of the united front, by making contact with social-compromise, allows the use of these influences’. The peasant question. Slogans like ‘land to the peasants’, meant to kowtow the peasants, undermine the political independence of the proletariat. The effects of this were already visible in Russia, where the peasant has become ‘the real economic dictator’. The national question. Support for the ‘self-determination of nations' is support for nationalism. A communist party should not only oppose the imperialist urges of the Polish state, but also the nationalist aspirations of Ukrainians, Belarusians, Lithuanians and Jews. Parliamentarism. ‘In the period of social revolution, and especially since the communist revolution in Russia, the battle for the system of Soviets of Workers' Delegates became the real slogan for proletarian masses all over the world’. A return to parliamentarism, even ‘revolutionary’ parliamentarism, introduces confusion within the ranks of the workers and provides a political space for reformist elements. Grzech believed that the source for the change in the political course of the KPRP lay in its composition, in the old PPS-Left activists (including some of the 3Ws) and political groups that in the years 1920 and 1921 entered the party (the above mentioned PPS Opposition, activists from the PPS, Poale Zion and Ferajnigte). The Comintern commission decided that ‘the accusations directed against the policy of the Central Committee of the party are devoid of any basis’, that the position of the Grzechist opposition ‘in all issues raised by it, is completely wrong and harmful, and is in sharp contrast to the tactics of the Communist International’. The Comintern urged the KPRP to ‘keep walking on the same road on which its own revolutionary tactics and the congress resolutions of the Communist International led it’ and recommended ‘the strengthening of ideological and organisational discipline in the party’. It also warned that following the advice of the opposition would turn the party into a ‘petrified sect’. In this way, all of Grzech’s criticisms were firmly rejected. The 2nd KPRP Congress (1923, Bolshevo near Moscow), at the behest of the International, sealed the new political course. The congress created a Political Bureau within the party to weaken the influence of the opposition and ensure compliance with the policy of the Comintern. The first political platform of the KPRP was criticised and rejected on a number of issues. Stefan Bartoszewski-Królikowski stated that the party must now represent ‘the nation against the capitalist class, not the working class against the nation’. Warski argued that in 1918 ‘we did not have in the country the class which was to make and carry out the socialist revolution’ – i.e. the working class. According to him, an equally important role was played by peasants, whom the party ignored. Henryk Lauer-Brand recommended that in order to form a united front the party should start talks with groups such as the PPS, the PSL „Wyzwolenie” (a left wing agrarian party), and even the Polish Military Organisation milieu (a group which rallied around Piłsudski). In the end, the party endorsed the slogan of the struggle for a ‘workers' and peasants' government’, the united front, the right of nations to self-determination and land for the peasants. Again, there was opposition to these changes. Wera Kostrzewa herself noted that within the party ‘each new idea is met with fierce resistance, and when we reach an agreement, it is not because we have decisively reassessed the matter and established our views, but because we were under pressure from outside’. Indeed, these changes were largely imposed from outside by the Comintern and then accepted by the leadership (including Kostrzewa). One could however argue how ‘new’ these views really were, and to what extent they instead represented a return to the policies of the Second International. At the 2nd Congress the Grzechists were only mentioned in past tense – ‘it is of course a terrible thing when the party, at a moment of direct struggle, is threatened from within, when its cohesion is undermined by the opposition [...] I dare say that among us that is no longer the case. To a large degree it was like that at the time of Ślusarski [Grzech]. If it is right that we were too gentle in relation to Ślusarski, that we were not decisive enough in responding to his questioning of the fighting capacity of the party, it is only because through Ślusarski we did not want to attack the workers who followed Ślusarski for ideological motives, because of their as yet insufficient understanding of political matters. We wanted to keep within the party and not repel those workers, and today one can say that we have succeeded. If today there are still remnants of the opposition, then in any case it is wholly loyal and submits to the dictates of the party’. Grzech, after losing support in the party and being condemned by the Comintern, was removed from party work around 1923. In 1925 Stein-Domski, another activist of the Left of the party, had a last chance to alter the political course of the KPRP. With factional bickering within the Russian party and the further extension of Russian influence over the International, Domski was able to climb to positions of leadership. At the 3rd KPRP Congress (1925, near Moscow) he had some success in rejecting a number of resolutions from the 2nd KPRP Congress – but soon that same influence of the Russian party and the consequences of Bolshevisation of the KPRP (which at that time took the name of the Communist Party of Poland, KPP) led to the dismissal of Domski. He was removed from party work in 1926, and later in Russia, together with Zofia Unszlicht-Osińska, joined the United Opposition of Trotsky and Zinoviev. To fully understand the significance of the Grzechists, we have to take into account the situation within the international communist movement of those years. Grzech and his followers were not alone in their criticism. In Russia already in 1918 a group of Left Communists (Bukharin, Preobrazhensky) opposed the signing of the Treaty of Brest-Litovsk and criticised trade agreements with capitalist states. In 1919 the Group of Democratic Centralists, the so-called Decists (Obolenski-Osinski, Smirnov, Sapronov), advocated a return to the dictatorship of the proletariat, so that the Bolshevik party could not put itself above the workers' councils. In 1923 Gavril Myasnikov set up the Workers Group of the Russian Communist Party, which strongly criticised the introduction of the NEP. In Germany in 1920 the KAPD was founded, a left-wing split from the Communist Party of Germany, led by theorists such as Herman Gorter and Anton Pannekoek. The KAPD, along with Myasnikov, the Communist Workers’ Party of Sylvia Pankhurst in Britain, and similar formations in the Netherlands, Belgium and Bulgaria, formed the Communist Workers' International in 1922 (sometimes called the Fourth International, although it had nothing to do with the later Trotskyist movement). In Italy in 1921 the Communist Party of Italy (PCd'I) was formed, mainly thanks to the efforts of the Left led by Amadeo Bordiga. During the Bolshevization of the PCd'I however, the Left was gradually removed from power. In 1925 Onorato Damen, Francesca Grossi, Bordiga and others set up the Committee of Intesa which criticised the degeneration of the PCd'I. The Comintern demanded the expulsion from the PCd'I of all those who supported the Committee. The Italian Left managed to reorganise outside of the Italian party, first in 1928 as the Left Fraction of the Communist Party of Italy, and later in 1943 as the Internationalist Communist Party. In that same period there were also many other groups which in varying degrees approached some of the positions of the Left Communists (e.g. the Workers' Opposition in Russia led by Shliapnikov and Kollontai, and the Entschiedene Linke in Germany). In other words, the Grzechist opposition had much in common with the Left Communist current and was combatted by similar methods. Unfortunately, it never evolved beyond the KPRP as an independent faction or party, and, as far as we know, never established real contacts with groups of Left Communists abroad (not even with the KAPD, to which it was so often compared). Grzech ceased his political activity after he was ousted from the party and condemned by the Comintern. In Russia since 1926, he found employment in the Soviet diplomatic and foreign trade services. In 1934, in preparation for the Great Purge, he was arrested by the NKVD and imprisoned on false charges. He died in captivity, most likely in 1937. Although Grzech lost the battle to preserve the revolutionary and communist character of his party, all his warnings proved to be correct: thanks to the pressure of the Comintern, Stalin's policies, and the collapse of the revolutionary wave in Europe, the ‘communism’ of the KPP indeed became an instrument of the USSR’s foreign policy, and for many party members the Nation, the State and the Party became something holy. The early politics of the party were condemned as ‘Luxemburgist errors’. Membership grew at the expense of accepting opportunistic changes, and ultimately the party was defeated and then murdered by the very Stalinist regime in which it put its trust. An interesting question is what happened to the Grzechists after 1923. A large part of them certainly gave in to party discipline. But was Józef Golędzinowski, a former member of the SDKPiL and the KPP, and one of the founders of the Anarchist Federation of Poland (AFP) in 1926, in any way connected to the earlier Grzechist opposition? What about the 1928 splitters from the KPP and the Union of Communist Youth who also joined the AFP? And what about the Polish Faction of Trotskyists of 1927, or the Union of Communist Internationalists of Poland, which had its beginnings in 1931 as a faction within the KPP? Certainly none of these organisations directly referred to Grzech, and Grzech himself was no anarchist or Trotskyist. Nevertheless, earlier connections between splits from the KPP that occurred after 1923, and the Grzechist current cannot be completely ruled out. Ultimately however the memory of the Grzechists faded, and their contribution to the development and defence of a genuinely communist programme was not consciously undertaken or developed by any left-wing groups in Poland. So who were the Grzechists? They were co-founders of the first communist party in Poland and activists within the workers' councils. They were the only political option in Poland in the years 1915-1923, which consistently criticised parliamentarism and social-reformism (the anarchist movement was smashed during World War I and reorganised itself only in 1926). They were militants for the liberation of the working class from the yoke of capital, constantly chased by the Polish state but ultimately murdered by the Stalinist counter-revolution. They were part of a broader internationalist tendency which opposed the degeneration of the Communist International and defended the best traditions of the socialist movement.